Cephalis externally obtusely cap-shaped, generally separated from the thorax by a slight change in contour. Thorax barrel-shaped, with smooth surface and circular pores longitudinally aligned. Lumbar stricture expressed externally by a distinct change in contour. Abdomen subcylindrical, hyaline, usually with one row of pores proximally and a row of teeth terminally. (Based on 25 specimens from 63.1-14-1), 10-12 cm; 66.0-2-3, 25-27 cm; and 66.1-8-3, 5-27 cm. Total length 115 to 190 μ. Maximum breadth 80 to 105 μ. 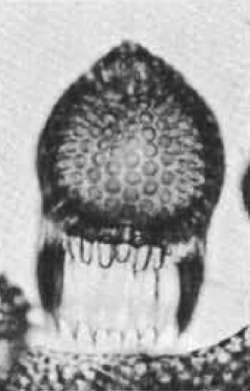 This species is distinguished from C favosum by the more pronounced longitudinal alignment of the thoracic pores, and by the abdomen being always subcylindrical.